The weather still seems to be progressing slowly towards summer and the spring flowers are still looking beautiful. It really is such an inspiring time of year. 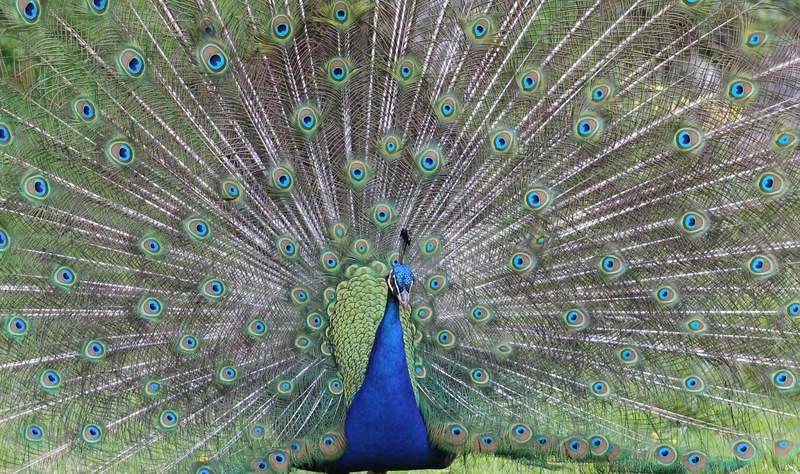 Even the peacocks are flirting with their incredible display of deep blue, 'eyed' tail feathers. 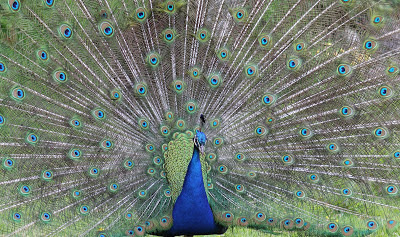 I always find them so fascinating to watch and wonder why in the bird world it is the males that have to do the 'dressing up'? Having eaten our last batch of ice cream, I had to get the ice cream maker out again this week. Like a child with a new toy, it is still drawing me in and begging me to use it! What is a girl to do? I guess I just have to oblige and try another flavour. So this week, I decided to try a straight liquid base (without egg), with melted white chocolate and then add strawberry sauce in swirls. I love the combination of white chocolate and strawberry and it works beautifully in ice cream, especially when mixed only lightly so that you have the contrasting strawberry-red against the white chocolate, both in colour and flavour. 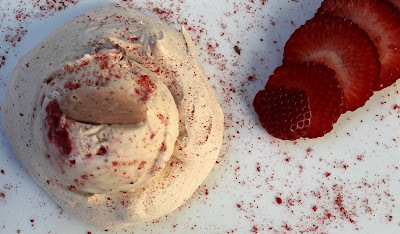 I added some freeze-dried strawberry pieces to the strawberry sauce mix which gave an amazing, unexpected chewy bite to the ice cream - a delightful extra dimension. It was perfect dumped on gluten free waffle cones sourced from Barkat (now available in Sainsbury). Made with good quality pure white chocolate, this ice cream is delicious, - the recipe I have given below. However, when I made one of my batches, I discovered that I had a couple of bags of Hotel Chocolat, white chocolate Citrus Puddles in my cupboard which I had bought a while back with the intention of using them to decorate a cake. When I checked the 'use by' date, I realised that they needed to be eaten, so I decided to try adding them to the ice cream mix as an alternative to straight white chocolate. When I eat chocolate, I prefer a really good quality chocolate, and Hotel Chocolat is one of my favourite brands, - expensive yes, but worth every penny and the easiest way to justify the extravagance is to just eat less (but enjoy and savour every mouthful). Citrus Puddles are large white chocolate buttons with a hint of lime and tangerine. 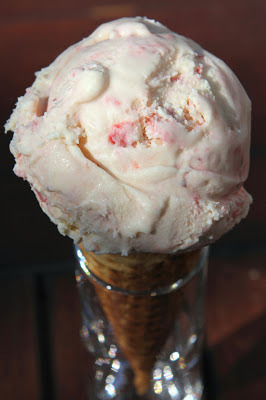 Added to this ice cream mix, they gave a wonderful additional citrus dimension which worked perfectly against the sweet white chocolate and strawberry sauce. 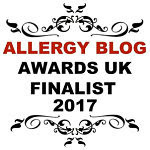 Having just checked the website, they do not appear to be listed any more (which is a real shame), but you could try adding a touch of finely grated lime zest to the mix and see what happens? After my last batch of ice cream (which was made with egg yolks), I had a load of egg whites languishing in the fridge, so had to find a suitable use for them. I often use them up with plain white meringue, but I wanted to find out what would happen if I tried flavouring meringue with freeze-dried fruit. I am a big fan of freeze-dried fruit, because it preserves longer term with the flavour intact, but with the moisture removed. 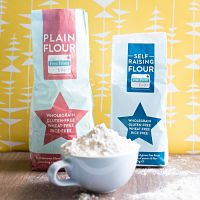 Although you can now buy it in some larger supermarkets in the baking aisle, I buy mine in larger quantities on the Internet from a company called Healthy Supplies. I often use it in cake mixes and icings without the risk of making the results too soggy and it seemed perfect, because of its dryness, to add to the meringue mix. It worked well................ The finished meringue is dry, crisp, beautifully pink and tinged with a delicious hint of strawberry. We have eaten them with cream and fruit, with Rhubarb Curd from my last post and now, with White Chocolate and Strawberry Ice Cream. Dress them up however you like, they are a delight! Pre-heat the oven to 150⁰C/300⁰F/Gas 2. 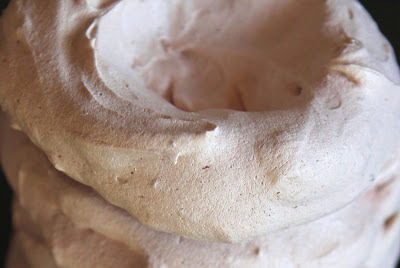 Prepare baking trays by lining with baking paper ready to shape your meringue nests. Whisk the egg whites in a large bowl until very stiff and dry. When stiff enough, add the sugar a little at a time, whisking very thoroughly between each addition. Whisk in the corn flour. Finally, whisk in the freeze-dried strawberry powder about a third at a time. The meringue mix should be very stiff, glossy and form soft peaks which hold their shape. Use immediately to shape into 'nests' by making a circular base the size of your nest and then adding a dollop of meringue mix on top and gradually working out to the edges with a flat knife, to form a nest shape (make sure the middle of the nest still has a good covering of meringue). Bake for about 2 hours until firm and dry (the meringue should not feel sticky at all). Check from time to time and if there is any indication of browning, turn the oven down slightly further and continue to cook until firm and dry. Turn off the oven, leaving the meringues in there until the oven has completely cooled. Remove the meringues when cold and either wrap and store in an airtight container, or use immediately. Place the chopped chocolate in a large heatproof bowl (preferably heat-proof glass) and add the cream, milk, icing sugar and glucose. Place the bowl over a saucepan of warming water (before the point of simmering) and continue to heat the water under the bowl, whilst stirring the ingredients. The bottom of the bowl should not come into contact with the water underneath. Bring the water to a gentle simmer and stirring frequently, continue to heat slowly, until the chocolate has fully melted and all the ingredients have fully blended. Do not heat too quickly or allow the mixture to become too hot, or the chocolate might 'seize'. Once fully blended, continue to heat the mixture, still stirring frequently until it is beginning to steam, but does not reach boiling point. Remove the bowl from the heat and pour into a cold bowl or jugs and leave until completely cold. Chill in the fridge until ready to use. Whilst your base ice cream mix is cooling, make the strawberry sauce so that it has time to cool before starting the ice cream freezing process. To make the sauce, place the prepared fresh strawberries, sugar and water in a small saucepan and gently heat until the mixture is simmering and the strawberries have begun to break down and release their juice. Turn the heat up, add the freeze dried strawberry (if using) and boil, stirring frequently, for about 5 minutes until the fresh strawberries are mush, the sugar has fully dissolved and the mixture has reduced in volume to a sticky, thickening liquid (but not a jam). Make sure you have ready a clean, prepared, freezable tub to store your ice cream when made. When your 2 mixes are cool, put the base chocolate mixture into an ice cream maker and freeze according to the manufacturers instructions. Once the ice cream has reached thick, 'soft-scoop' texture, turn off the machine and remove the paddle from the bowl. 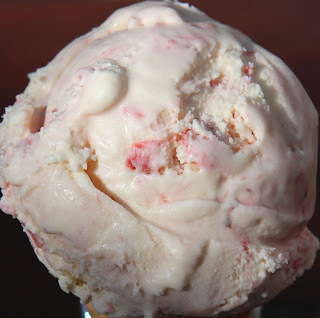 Pour the cold strawberry sauce into the ice cream mix and using a clean mixing spoon, gently swirl or fold the 2 mixes together, making sure that you don't over-mix, so that you can still see streaks / areas of dark red strawberry in the pale ice cream. Once fully frozen, serve in a cone, or place a scoop in your meringue nests and drizzle with your favourite sauce or sprinkles.